The comments run counter to his past praise of the website. President Donald Trump reacted Thursday to news of WikiLeaks founder Julian Assange's arrest in London by distancing himself from the website that he routinely embraced during the 2016 election. "I know nothing about WikiLeaks," Trump said when asked by ABC News' Karen Travers whether he still "loved" the organization. "It’s not my thing." Trump told reporters in the Oval Office alongside South Korean President Moon Jae in that any decisions regarding Assange's prosecution would be left up to Attorney General William Barr. (Victoria Jones/PA via AP) Julian Assange gestures as he arrives at Westminster Magistrates' Court in London, after the WikiLeaks founder was arrested by officers from the Metropolitan Police, April 11, 2019. During the latter months of the 2016 election, Trump offered effusive praise for WikiLeaks' efforts to undermine Hillary Clinton's campaign by releasing a cache of emails the U.S. government has alleged was provided by Russian intelligence. "This WikiLeaks stuff is unbelievable," Trump said during a Florida rally less than a month from Election Day. "It tells you the inner heart, you gotta read it." The operation faced significant scrutiny as a part of special counsel Robert Mueller's investigation into Russian interference in the election and possible collusion with members of the Trump campaign. In November 2017, the president's son Donald Trump Jr. revealed that he communicated with representatives from WikiLeaks during the 2016 campaign through Twitter's private messaging service. And in late January of this year, Trump's longtime friend and self-proclaimed 'dirty trickster' Roger Stone was indicted by Mueller's office, which included charges that Stone made false statements to Congress regarding his communications with associates about WIkiLeaks. In testimony before Congress in February, Trump's former personal attorney Michael Cohen alleged that he overheard Trump and Stone discussing the WikiLeaks email dump in the summer of 2016, but was unable to offer any concrete evidence supporting his statement. Both Trump and Stone have denied any such conversation took place. Prior to his presidential run, Trump was a staunch critic of WikiLeaks and even suggested that the "death penalty" should be under consideration for the website's dissemination of classified U.S. embassy cables. 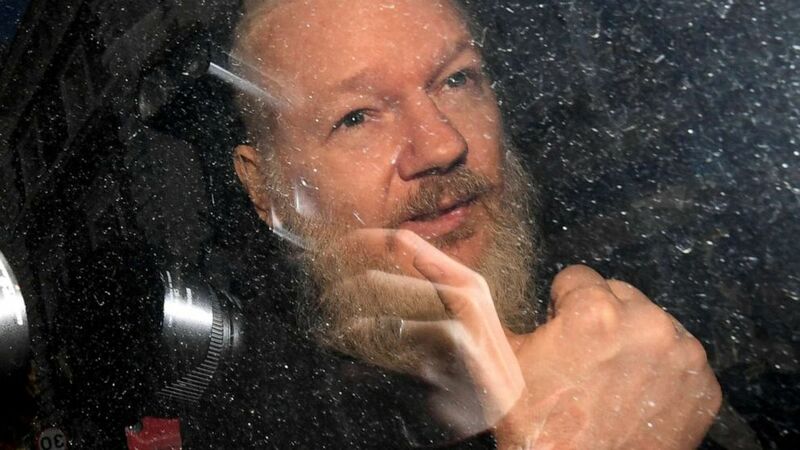 And since taking office, the Trump Administration has mounted an aggressive campaign to further uncover WikiLeaks' connections to Russian intelligence and pressure the Ecuadorian government to remove Assange from its embassy in London. Just hours after Assange's arrest Thursday, U.S. attorneys in the Eastern District of Virginia unsealed a computer hacking indictment against the Wikileaks founder, and prosecutors said his arrest was pursuant to a U.S.-U.K. extradition treaty, though it is not immediately clear when or if Assange will actually face trial in the U.S.